← High Unemployment in Britain is its own Government’s Fault. No-one else’s! It’s high time for some clear thinking on the subject of debt. Take a look at any financial newspaper, any mainstream TV business program, most economics and political websites and the subject of debt looms large in most, if not all, discussions. We are constantly told how that debt is a huge problem for us all. We might know from our personal experience just how bad it is to be in so much debt that we can’t afford to repay the interest, let alone the capital repayments to reduce the loan itself. The take-home message everyone is given is that the world is in deep financial trouble and that if we don’t knuckle down and fix the debt problem, the debt problem will fix us. It seems we are due to fall over the edge of that fiscal cliff in the very near future if we don’t get our act together. There is story after story in the US media about how this isn’t sustainable. How its just not realistic to keep borrowing from China and Japan. In the UK the situation looks bad too! Lets take a look at just how much of a surplus the Chinese and Japanese have managed to build up over the past few years. This looks odd. but it looks like Japan is broke too! What about China? Surely they must be in the black! No. They don’t look to be doing too well at all. This is not what we were told. What about all those exports? So what about the world as whole? Surely that must net to zero. The creditors and the debtors must be equal. No, it obviously doesn’t. So just what’s going on? All the wonder economies are in debt too. Germany is in debt ($3 trillion) Singapore is in debt ($400 billion) Do we owe all this money to the extra-terrestrials? There is no need for anyone to worry, at least in my opinion, that we have to keep our extra galactic creditors happy. They are not going to send in the bailiffs and repossess our planet. If I am ever proved wrong about that, they will not be at all interested by the digits in our computers , or the printed pieces of paper we call money. It will the resources of our planet which might interest them and I would expect they, unlike many of us Earthlings, would be smart enough to appreciate the difference between money and resources. They should also be smart enough to know that all money is created by crediting and debiting accounts, and that money functions as a unit of account, medium of exchange, store of value, and record of debt. Every debt has a corresponding credit denominated in the unit of account of that jurisdiction, so that all debt as someone’s liability is someone else’s asset, which nets to zero. Since money is not only someone’s debt (a payable) but also someone else’s credit (a receivable), it is just as true to say that the world owns over 57 trillion in financial assets, expressed in USD, as it is to say that the world owes 57 trillion in financial liabilities. If there were no credit-debt relationships, that is, if all financial liabilities were extinguished, then there would be no money, and exchange of goods and services would be reduced to barter. (Acknowledgements to Mike Norman). Do politicians not understand all this themselves? Don’t they understand that all governments have to be in debt? That would be stupidity. Or do they understand all this very well but just like to scare us all with these huge numbers? Do they deliberately lie to the very people who pay their salaries? At least under their own understanding of economics they do 🙂 That would be criminality! Which is worse? To understand why this is the case, that debts are just another way of expressing assets, we need to start right at the beginning and take a look at what money is and why it has a value. This entry was posted in MMT General and tagged Borrowings and Lendings, Central bank, Chartalism, Economic system, Government, Government debt, MMT, Modern Monetary Theory, Post-Keynesian economics, Quantitative Easing. Bookmark the permalink. surely the governments dont have to be in debt – as long as the private sector is borrowing then there will still be a money supply. Or are you defining National Debt as including private debt? No, the National debt doesn’t include private debt. Th creation of money in the private sector happens when loans are issued. The net assets sum to zero both before and after the loan. When governments issue money into the economy that is done by spending rather than lending. For the private sector to have net positive assets it needs a government to issue money and therefore create its own liability. Offsetting that is a Sovereign Wealth Fund of some $818 billion. This is oil money they don’t know what to do with! 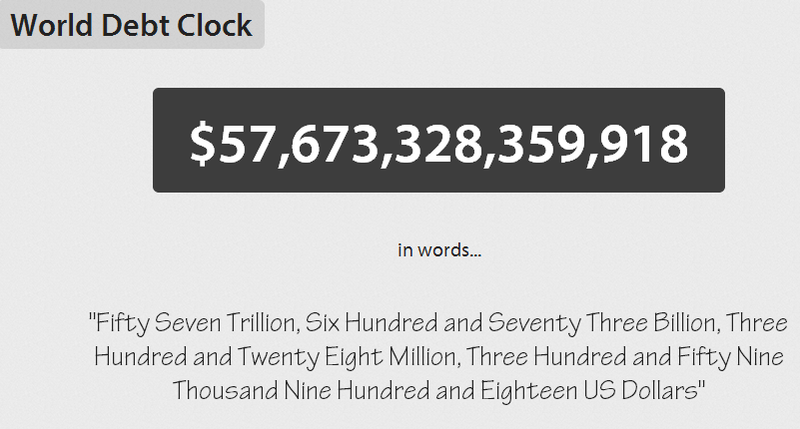 So why don’t they pay off their National Debt and have just one account which would be in the black by $661 billion? The answer is that the Norwegian National Debt serves a function just like any other country’s National Debt. The Norwegian private sector, especially their banking sector, needs their Government to hold debt, in Krone, so they can hold assets in Krone. It would be interesting to see who comes knocking if we collectively decide to write off these debts. All that’s needed is confidence in whatever replaces the current lending systems. I don’t think anyone will come knocking because it will be found to be a small number of people who have mostly inherited their wealth. Most of their returns on investments will come from lending money to governments to pay for their investments in defence, think tanks, data mining and anything else designed to entrench the positions of benefactors to this ruling class. If you were wealthy, selfish, slack and scared, wouldn’t it be the natural thing to do? Great blog. But i am missing something on this one. Surely all the governments could owe in total 57 trillion if they owe it to the non-government sector. But a challenge with governments is that lack of asset accounting. Net debt a more significant problem than debt. If i buy a 1 million house and have a mortgage of 100k, I have a nett asset of 900k but governments tend to only report the debt component. Even a government with debts could loan another government if assets far outweigh debts. Yes you’re right in pointing out that real assets aren’t included in the sectoral balances. It’s the world’s total financial assets that have to equal the total financial liabilities. It’s impossible to put a value on the world’s real assets. They are what really matter. Life on earth depends on those. Our financial system is a human construct designed for our own convenience. The money is owed to Pluto, which is why it was downgraded from planet to dwarf planet, because of how much money it made by selling resources which made the planet smaller. I think what you’re trying to illustrate here has some merit. But it seems like you are assuming all debt is foreign and then trying to balance country against country, when in fact US debt also consists of borrowing against the social security fund, military pensions, etc. am I missing something? The UK has the fifth largest GDP of any country is how they work it out. The UK currency is an IOU of the UK government. So what? The government has to be in debt so that everyone else can have assets denominated in UKP. National and World Debt are only financial concepts, the debt isn’t actually there. The idea is that a country can borrow money on future taxes, ie, they print more money and spend it. It holds no implications except the inflation, devaluation, and eventual death of a currency like the Euro, Yin, or Dollar if constantly continued. No one’s coming to enslave us. Relax. we live in a economic system which register debtor but not the creditor and I can’t imagine myself as a debtor. What would be the outcome of a country say Australia, paying down the debt by increasing taxes? Wouldn’t they then be able to go into a massive amount of debt again by spending big on something like infrastructure? I see some countries on debtclock with small amounts of debt per capita, what is stopping some of these countries from doing this? First of all we have to define what we mean by debt. The simplest way to eliminate the debt is to take advantage of any deficiencies in the way it is defined. So for example in the USA they don’t include the coinage. 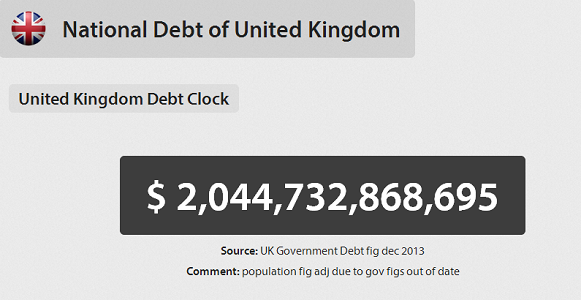 So if the USA minted 20 x trillion dollar coins then -hey presto – no debt! Similarly QE has supposed reduced the debt in the UK. The monetary base isn’t included. But if we take a more sensible view an include all Govt liabilities. Then we can see things a little more clearly. Then Government liabilities have to equal everyone else’s assets. So reducing Govt debt is the same thing as reducing everyone else’s assets. Which they can do by imposing taxes as you suggest. But why would Australia want to reduce everyone else’s financial assets – as measured in Australian dollars? There can only be one reason. That’s to reduce the possibility of higher than desired inflation. If the Australian economy is running too hot and inflation is the major worry then some debt/deficit reduction may well be in order. do u mean that the world bank is owed by the demons #invisibles? Pingback: 10 Things You’re Not Supposed to Know - Soul, Spirit & guidance ! Debt is to make sure the private sector dominates government. If government simply direct issues to citizens, they have less incentive to work for the profit of the rich. If government simply direct spends on things like bridges for currency creation, the rich cannot point to scarcity to keep the poors poor.